In this activity, students will compare and contrast two documents from the Revolutionary period written by 1) a combined group of Native American tribes and 2) an American territorial governor, Arthur St. Clair. For grades 8-12. Approximate time needed is 60 minutes. The original documents can be difficult to read. Students may need help with the handwriting. Because of the way ink came out of the pen, an “ss” was often more easily written with a “long S” that might look like “fs.” Younger students especially may need help understanding the historical language of the documents. If students click "View Entire Document" below each document, they will be brought to a page that includes a full transcript. Explain to students that when they begin the activity, they will be reading two documents to determine the point of view presented in each. The documents also illustrate differences in culture and tradition between the Native Americans and primarily Christian settlers. The Native Americans in this instance show an understanding of governments and treaty-making, which may be surprising to students. Following the Revolutionary War, there was ongoing conflict over the possession and use of former Indian lands between American settlers and Native communities in roughly the same area of the United States, the Old Northwest Territory. Politically, Indian tribes were recognized at this time—both by Great Britain and the United States—as independent nations, even though they were living within the boundaries of the larger power. Later in 1832, however, their status was changed by the Supreme Court to “domestic, dependent nations.” This particular group of Native American tribes had previously taken part in a treaty with Great Britain, the Treaty of Fort Stanwix (1768). Information about the Treaty of Fort Stanwix can be used to show this treaty as a source for issues that are obvious in the Native document. 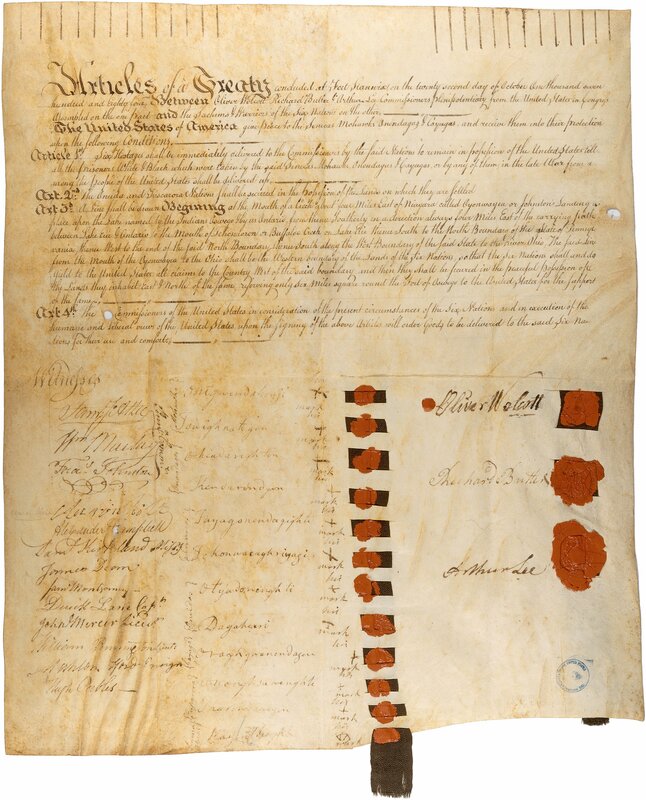 See the original treaty between the Confederated Indian Nations and British of 1768 and the Treaty of Fort Stanwix between the U.S. and Iroquois of 1784. The mouthpiece for the group of united tribes represented in the first document was Joseph Brant, a Mohawk Indian who had been educated in English schools. Arthur St. Clair, the author of the second document, was born in Scotland, came from a long English military tradition, and had been a general—first in the English and later in the American Army with George Washington. He was, at the time of this speech, the Governor and Commander in Chief of the Northwest Territory. Direct students to open the activity and study the documents individually or in small groups. Alternatively, this activity could be used by an entire class to facilitate a debate between groups representing the Indian Nations and the governor or his settlers. When students have finished reading and comparing the documents, they should click When You're Done. They will be presented with the following questions that will help them review and analyze the contents of each document. They can submit their answers via email or use them to prepare for a class discussion. • What had the Indian Nations expected when the Treaty of Paris was signed between the United States and Great Britain that ended the Revolutionary War? Did they have expectations based on former treaties? • Based on the contents of Governor Arthur St. Clair's speech, how important was the "Indian problem" to him? What did he advise the settlers to do? • What do you think you would have done next 1) if you were Native American, or 2) if you were one of the settlers? For more information about the featured documents, follow the links below. Advanced students or those interested in Native languages can view the manuscript from the United Indian Nations in the Mohawk language. To the extent possible under law, National Archives Education Team has waived all copyright and related or neighboring rights to "Indian Nations vs. Settlers on the American Frontier: 1786–1788".